Since starting a weight loss program, I am in the kitchen more than I’ve ever been – and you know what? It’s been really fun to discover that I enjoy cooking! One of the snacks I keep making is deviled eggs. It’s hard to get sick of them, because there are endless ways to make them! season with salt, course black pepper, garlic powder. . . then, get creative! … or just dust with paprika! 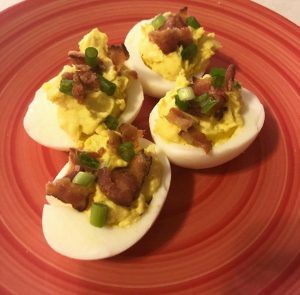 You really can’t go wrong with deviled eggs… and you definitely don’t have to wait for the holidays or summer cookouts to enjoy them! Share your favorite combinations with me at Jillene@magic98.com. Connect more with Jillene Khan by clicking here! Find more recipes from the Magic Crew here.